Every website owner wants more relevant traffic on their website. For many, that leads them to look for ways to appear higher on Google in the search results. One of the best ways to accomplish this goal is to appear as a featured snippet. Appearing as the featured snippet, like all efforts to rank better on Google, is part of the sometimes cryptic and muddy world of search engine optimization (SEO). 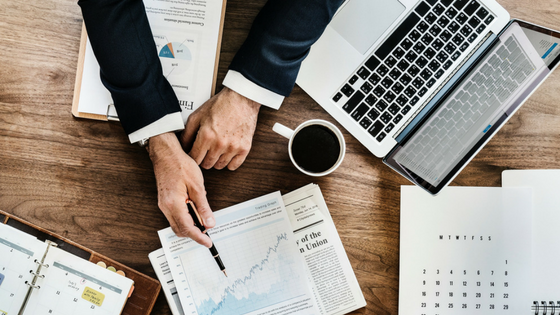 For most entrepreneurs without previous experience, diving into the world of SEO can be confusing and time-consuming. That can be scary and for good reason. Many SEO practices can even be dangerous. But there are also plenty of SEO tactics and strategies to help you rank better. Some are important and others can be ignored by most. How do featured snippets factor into SEO? Let’s start with the basics. The featured snippet is a special block of information shown above everything else on Google’s search engine results pages (SERPs). This block is normally a relatively direct answer to a question posed in the form of a search query. 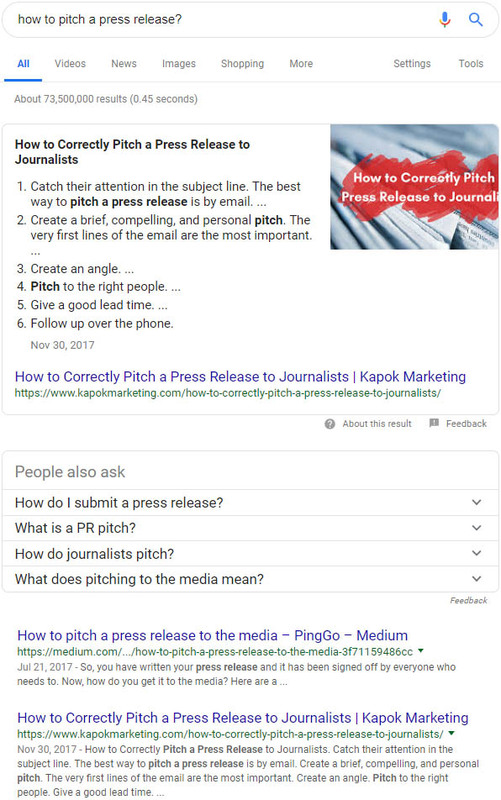 For example, let’s say you search for “how to pitch a press release?” You might see the pictured featured snippet of Kapok Marketing’s post in Google’s SERPs. In this instance, Kapok Marketing’s post entitled “How to Correctly Pitch a Press Release to Journalists,” is shown as the featured snippet. The post answers the searcher’s question quickly, accurately and concisely. You’ll also notice that it appears before all of the other results. It has the title and URL near the bottom as a normal result would. But it also includes a bunch of additional information from the page that would not have appeared had it not been listed as a featured snippet. A list featured snippet shows a list of items as an answer to the search query. This can be a list of items like car brands or chicken recipes. It can also be an instructional list, like the Kapok Marketing page we mentioned earlier. In this case, it’s an ordered list of how to accomplish something. A paragraph featured snippet is just a featured snippet containing a single paragraph as the answer to the question. Unlike the Kapok Marketing featured snippet, it contains the information in the form of a paragraph. It’s usually a few sentences pulled from the page that answer the search query. A table featured snippet shows data that answers a search query presented as tabular data. These snippets normally appear for queries best answered with numerical or time-based data that is most impactful in a table or graph. This could include prices of a certain type of housing by region. Another good example could be inflation rates by year. A video featured snippet shows a video as the answer to a search query. It will be a video from YouTube and it may have a suggested portion of the video to watch as the answer to the query. Why Do You Want to Be the Featured Snippet? 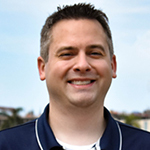 Being in the featured snippet is often referred to as position zero. This may sound lonely, but it’s a good thing. The featured snippet, or position zero, is a great place to be for any business. When your website is featured in this way, you not only appear at the top of the search results, but you get a ton of additional real estate. Just being at the top of the normal results on Google is great, but your result still looks the same as all of the others. It’s easy for someone’s eyes to drift to result number two or three if they have a catchy headline. Another important thing to keep in mind is that you don’t have to be in position 1 to be the featured snippet. This means by becoming a featured snippet, your page can jump ahead of other pages that would normally rank higher than yours. Just look at our Kapok Marketing featured snippet from above, we rank in position 2 organically in that case. But because we’re the featured snippet, we now appear in position 0 and position 2! With the featured snippet, your website’s page is featured in a huge box that often takes up most of the above-the-fold real estate in the searcher’s browser. This is almost always the case on mobile, and a larger and larger percentage of Internet traffic is becoming mobile. As we mentioned earlier, you still appear organically in the regular results. This means you can often appear twice on the first page of the search results with a single page! That is a great way to get additional exposure on Google. One caveat is that you need to make sure you write your text in such a way that the person still wants to go to your website. You want to answer the question, but also give them more reason to continue on to your website. The exception, or alternative to this, is to accept you featured snippet as a branding or exposure play. In this scenario, the searcher may remember your name when thinking about the topic of their search query. Some website owners may not like that Google is giving away all of this information before the searcher even visits their website. If you feel this way, Google also lets you add a special tag to your website to exclude yourself from featured snippets. While this may be appealing to some, we don’t recommend it. How Do You Get in the Featured Snippet? That’s all great, but how exactly how you get your page(s) to appear as featured snippets? Let’s start with the bad news, according to Google, you can’t just mark your page as a featured snippet. Google says they display a result as a featured snippet when their search engine “programmatically determines that a page contains a likely answer to the user’s question.” That means there is still hope of taking certain steps to increase your likelihood of appearing as a featured snippet. Google also explains that they are always working to improve the featured snippet. They want to always show the most useful snippet, and that means the featured snippet can change from time to time. This is also good news if you want to appear in the featured snippet, but another site is already showing up in the SERPs. So what tangible steps can you take to earn your website a spot as a featured snippet? Google says you can’t mark your page as a featured snippet, but they also tell you their ultimate goal. They want the featured snippet to be whatever best answers the searcher’s question. In our example earlier, we appeared in a featured snippet about press releases. If you read our article, we answer that exact question directly and in a comprehensive way. But we also kept it clear and concise. Don’t get too far off track. If your answer starts to go in too many different directions or is not on point, you won’t have much success. Google will find a resource that provides a more direct and relevant response to the user’s query. Figure out what single question you want to rank for as a featured snippet. Create a page with a clear and complete answer to that question. The next important thing we did in the blog post is make the TL;DR version of the answer pop. It needs to stand out in a way that is obvious to both a regular user and Google. How do you do this? The easiest and fastest way is to use HTML heading tags. This involves wrapping your headings in HTML tags that look like this <h1>My Title</h1>. These headings should also be all or most of the brief answer to the question you’re trying to rank for. You can also nest headings using these additional HTML heading tags: h2, h3, h4, h5, h6. Some website platforms, like WordPress, also offer user-friendly WYSIWYG, or “what you see is what you get,” editors. These editors often allow you to easily add these heading tags. If that’s not the case for your website, you may need to have a web designer or developer help you make sure you are using these sorts of tags correctly. 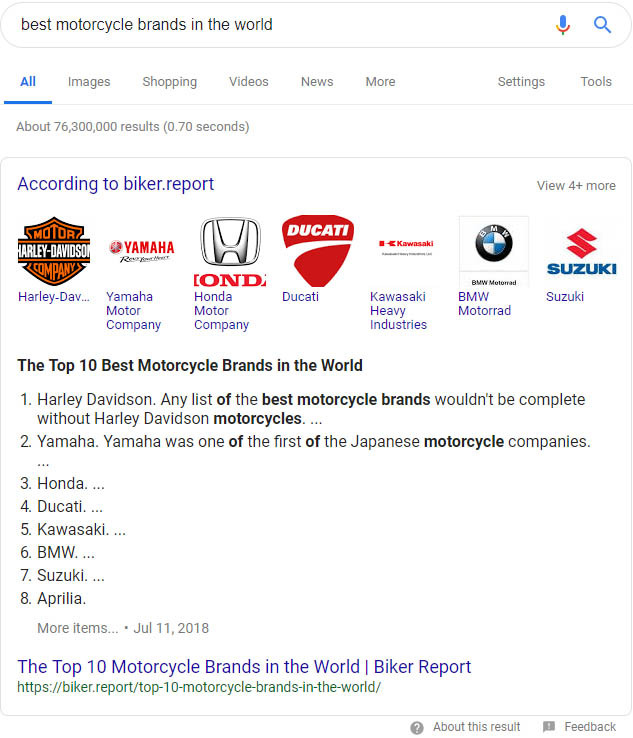 We actually helped Biker.Report, a motorcycle news site, answer that exact search query with a post entitled “The Top 10 Motorcycle Brands in the World.” The headings on the page are the motorcycle manufacturers. Unfortunately, step 1 and 2 were the easy steps. Step three is where the rubber meets the road. For most search queries, especially those with any sort of commercial intent, there is fierce competition to rank. If you already rank in position 1 or 2, step 1 and 2 might get you over the finish line. If not, you’re going to need to make sure your website is up to snuff, in terms of search engine optimization (SEO). Loads very quickly on all devices. Now, that is just what you need to do within your own website. If the competition is really tough, you’ll also need to focus on building the authority of your website. In technical terms, this means you want external links to your website and brand mentions. External links are just other websites, preferably authoritative ones, linking to your website. It’d be even better if they linked directly to the page you’re trying to rank as the featured snippet. But any type of legitimate link from a reputable website will help. Brand mentions are people who search for your brand on Google and then click through to your website. For us, this means people searching “Kapok Marketing” and continuing on to KapokMarketing.com. Now, don’t go buy links from random people or hire people to search for your brand. Techniques like this do occasionally work for expert “black hat” SEO marketers. Those people spend a lot of time doing research and testing, and even they often eventually get caught by Google. Then they have to start over. That’s a horrible strategy if you’re running a business and want to stay in business for the long run. You probably don’t have the time to learn all of the ropes of doing successful “black hat” SEO either. It’s a far better idea to stick to authentic reputation building. If you want to get the most out of Google, you might want to keep featured snippets in mind. They are a powerful way to increase your exposure for certain queries on Google. If you already have great content, it can sometimes be quite easy to pull off. It’s just a matter of making sure your content is worded well and your website is both user and SEO friendly. If you don’t have a lot of content on your website, this could be a perfect opportunity to get started. Some of the best content for many businesses is often the exact type of content that also is perfect for getting featured as a featured snippet. Just add a page to your website that answers a question that you are knowledgeable about and that your customers are asking. That will be a double win. It helps your existing customers who already visit your website. Plus, it attracts new customers when they search and find your website as the answer to their question in the featured snippet. Have you had any experience with featured snippets? Either as a website owner or a Google user, let us know what you’ve seen. Let us know in the comments about any good or bad featured snippets you’ve achieved for your site or seen as a searcher.